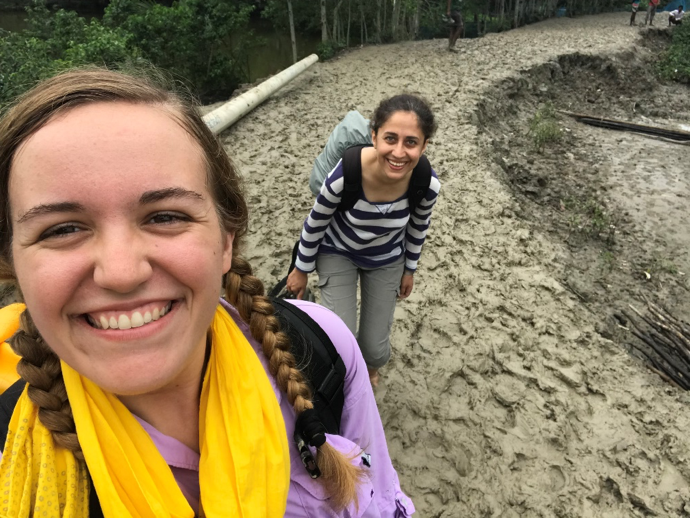 Master of Global Affairs students Jamie McClung and Chista Keramati are currently working in Bangladesh with their global partner, Bangladesh Centre for Advanced Studies. 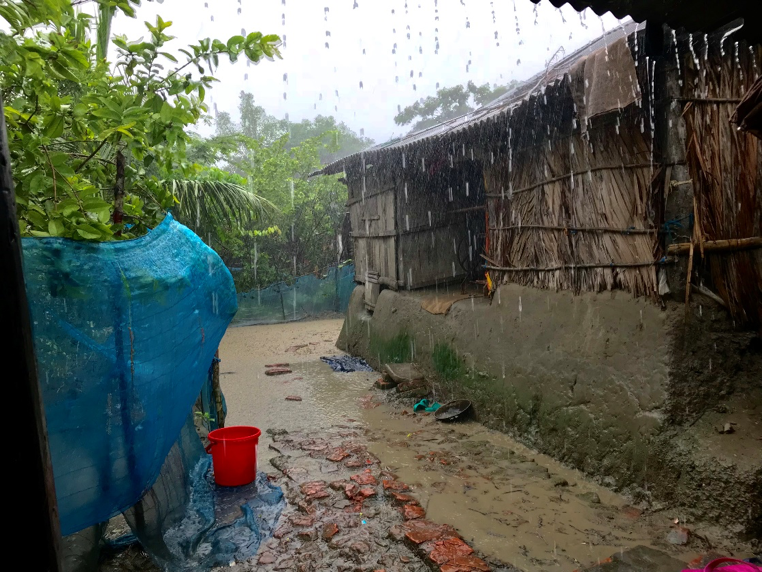 Below they reflect on their most recent field site visit and their experiences interviewing rural community members in the southwest part of Bangladesh, the Satkhira district. This week, Chista Keramati and I traveled to villages on the edge of Bangladesh where people’s livelihoods rely on the resources of the Sundarbans—the world’s largest mangrove forest. Fishermen throwing their nets to catch fish and shrimp for future sale in the market. A boy stands pensively with land on one side and water on the other, a daily reality for the people near the Sundarbans. En route to the villages, we confronted slick and muddy roads, where one wrong step meant the difference between staying upright or falling into the rivers and ponds used to hold drinking water. The challenge of navigating these roads was actually quite enjoyable, as it gave us the opportunity to connect with locals, who graciously helped us make our way safely. We smile as we try not to slip on the road. 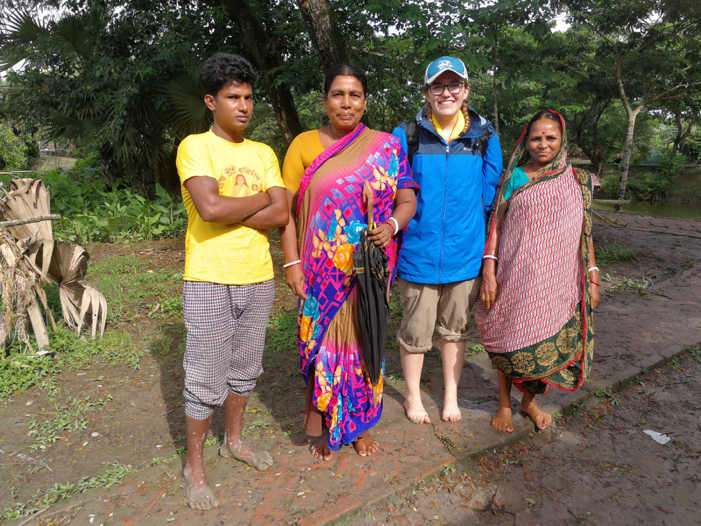 Our deep tracks in the mud, and our presence in the villages, seemed to leave a meaningful impression on the communities, as NGOs and even government officials do not seem to visit here often, especially not during such wet weather conditions. I stand with villagers who helped us trek down the road to their homes. Most meaningful to me was all the people who helped us—each day, and in each community—so that we did not fall. Seeing how adept they were at navigating these treacherous conditions left me with two thoughts: 1) the very location of their homes leaves the entirety of these communities vulnerable; and 2) the sheer strength and resilience within these communities is why they are surviving on very little outside support. Much of this strength comes from traditional and indigenous knowledge. Most people still live in traditional homes, which are intentionally built with locally grown materials and methods to withstand floods or other climatic hazards. Near the Sundarbans, a traditional home built on a mud plinth (the raised ground) to keep the home from flooding during rainy season. Through our interviews, we discovered that international trade and the strength of multi-national companies are threatening these ways of life and contributing to many of the development challenges we are witnessing today, from malnutrition to lack of housing. Local communities are quickly losing access to the resources they have depended on for generations, as multi-national companies and NGOs introduce services and materials that don’t align with traditional ways of life. The question for me now is: how do we create locally innovative development that delivers sustainable services in line with traditional ways of life? I wrote my first blog post after I had spent barely ten days in Bangladesh. My research partner Jamie and I had not yet interviewed many people. Dhaka, the capital, and its busy streets and narrow pedestrian areas were the only places we had seen of this geographically and ethnically diverse country. Simply put, I knew not what to expect. This past Friday—fifty seven days into our stay, and at the closing of our second field trip in rural Bangladesh—we gathered in the local restaurant below our hotel to have our last breakfast in Shyamnagar, a small coastal town in Southwest Bangladesh. While waiting for our now usual “Naan roti and eggs,” we chatted about the past week’s experiences interviewing rural communities, local government officials, and NGOs about their work and life in coastal Bangladesh. Jamie and I were baffled by what we had heard, observed, and experienced during the past week. 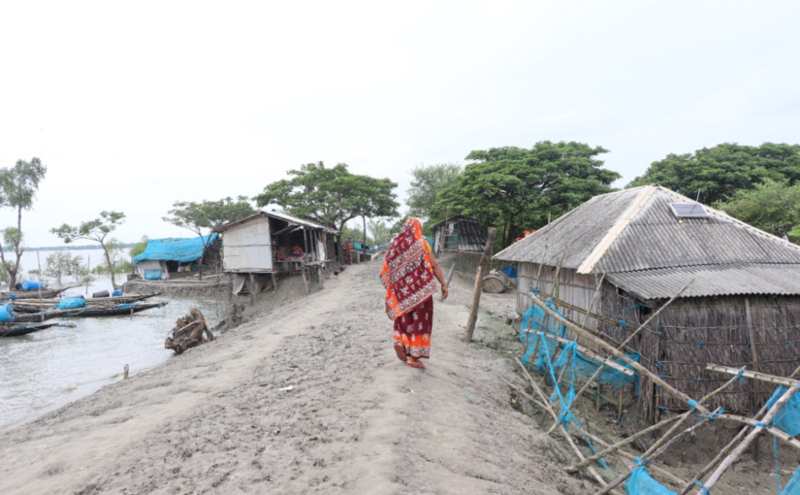 Just one day prior, we were on an island where people had lost their land and livelihoods to river bank erosion, and lost family members to cyclones. 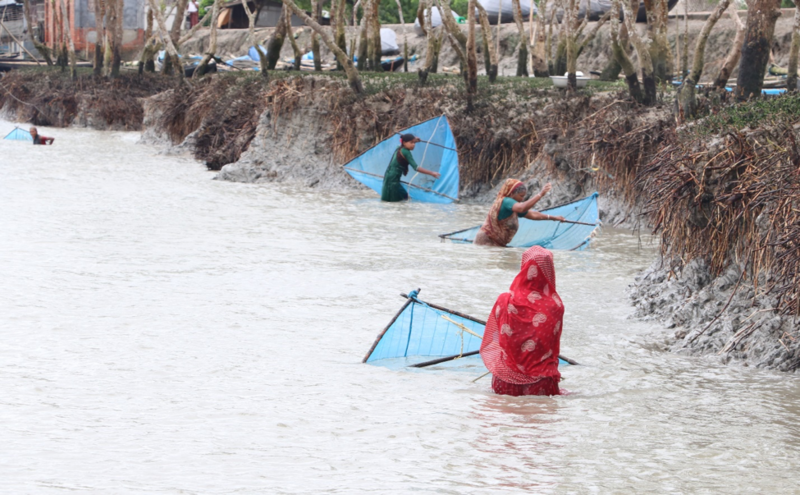 Women fishing at the bank of Kholpetua River during low tide. They earn somewhere around $1-3 per day selling their catch to local traders. We walked some of the most difficult hikes of our lives where the seemingly trivial task of going from one village home to the next was a huge challenge in and of itself. Constant heavy rain turned the island’s dirt roads into little (or big) pools of sticky and slippery mud. At every step of the way, I tried to remind myself that, while this was for me a perhaps one-time hardship, it was an everyday routine for local habitants. A local woman walking on the muddy village road, which also serves as the river embankment. Storm surges present difficulties in commuting and threaten access to their only roads in and out of the village. Of course, locals are much more skilled at handling rain and mud than we are. I was reminded of this fact when Shahrbanu—a local woman who had patiently guided the two of us through the mud—bid farewell to us and turned to go home to prepare her family’s lunch. Once assured we were standing on a safe spot, she broke into a sprint towards her home, not minding the slippery road, the heavy rain, and the mud splashing all over her bright red sari. She ran cheerfully and freely as though all the hardships that nature was imposing on her at that very moment were nonexistent. We watched in awe as she disappeared into the mangrove trees and bushes in the distance.